Montreal’s JEM (Jewish Employment Montreal) Workshop, a non-profit organization that employs people with cognitive disabilities at an adapted workplace, is $5,000 richer today thanks to three Hebrew Academy students who won a grant on its behalf. Recently,. four semi-finalist student groups representing JEM, The Family Store, Shield of Athena and Hatzoloh presented their charities before their peers and a panel of judges comprising Hebrew Academy alumni and students. 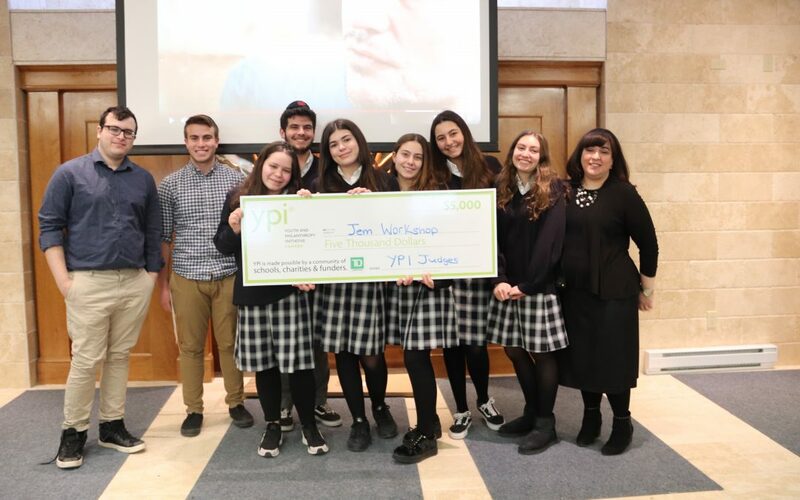 The nail-biting face-off signified the climax of students’ months-long participation in the Youth Philanthropy Initiative (YPI), a project of the Toskan Casale Foundation that encourages teens to research and advocate for a local charity for the chance to win it a $5,000 grant. “YPI gives students an education and experience that they would never find in a textbook,” said Hebrew Academy’s lead YPI teacher, Celia Natanblut, who has been incorporating the initiative as part of her Grade 10 Ethics and Religious Culture (ERC) curriculum for the past six years. Hebrew Academy is the only Jewish school in Montreal that participates in YPI. Based on their research, students prepare a request for funding proposal on behalf of their charity, along with a presentation to introduce their cause to their peers. Congratulations to winners Ronit Benizri, Alex Malamud and Mikayla Abenhaim who were presented with a giant cheque for their organization!